For those of you like me, who loved Life After Life by Kate Atkinson the release of A God in Ruins probably had you dashing to the book shop. The latest novel traces the experience of Ursula's much loved younger brother Teddy, a man who fought in the Second World War as a fighter pilot. Unlike the previous novel, this work sticks with one life with all of its dark twists and turns. The novel shifts time periods recounting both the present day and Teddy's difficult relationship with his only child Viola, his life during the war, and his marriage to childhood sweetheart Nancy. The story shifts and lilts as Atkinson works to slowly reveal the hardships of Teddy's life. No less important are his grandchildren Sunny and Bertie. Like in its predecessor, one of the story's central themes is family, and how the experience of war and life's own twists and turns impact this. Teddy is a likable character, if his reluctance to express himself is sometimes a little grating. Perhaps one of the strongest elements of Atkinson's book is the exploration of the return to a civilian life after a time of crisis and war. The reader is witness to the horrific things Teddy experienced during the war which could hardly be in greater contrast to his life as a small town journalist in northern England. As a result, he seems to be caught in an impossible situation, in which he finds it difficult to ever truly adjust to a 'normal' life. This is perhaps best articulated through his relationship with Viola; the pair of them run circles around each other each a victim of their time, unable to ever connect in the way Teddy had hoped. All this is to say that this is another competent and fascinating novel. My one criticism (if you can call it that) is that the book is tremendously sad. While Life After Life had its moments, there is something about A God in Ruins which left this reader with little hope in the end. 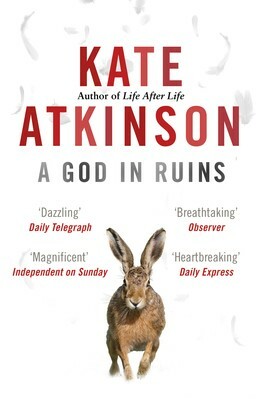 Still, there's no doubt that the novel belongs on the Baileys Prize longlist.